The viz ends. SIX TO THREE. Laev (Camellia's HeartMate) comes in, so does Dani Eve Elder, who lives and works on the Ship. THREE TO FIVE, with mentions of the Captain. T'Ash scries the Ship holding a young fox kit, a cat hisses offstage. FIVE TO EIGHT. She meets Danith D'Ash and the fox kit, Glyssa's new Fam. ONE TO THREE TO TWO at the end of the scene. I can keep track of this. My steeped-in-Celta fans can probably do the same. Mentor can (but will howl at the group scene). The rest of my critique group (esp. the guy) not so much. I like this scene, but I know it must be cut, giving me a headache. I can delete Dani Eve and summarize the conversation about the telecommunications satellite (Laev needs to be there). I can probably get Glyssa alone in the landing bay when T'Ash calls...still. I am not sure what I need to do to stop this rampant group-scene tendency of mine, except concentrate harder when I am working. May you not entangle yourself in any problems today. I love coming across something that I think as a story prompt, that will engender a story if thought about, and I especially love to share these with other writers, because no one's story would be the same. May you lose nothing you don't want today. Every manuscript, book, process is different...and I think I've finally realized that for revision phases I have to proceed in order, and not jump around from section to section. 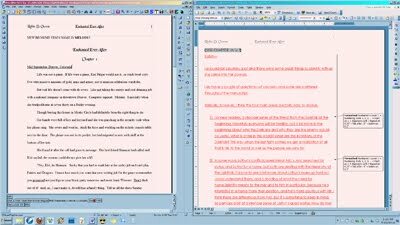 I have gotten accustomed to revising online, finally, with my big monitor to help. To the left is my work in wordperfect, to the right is editorial comments in Word. 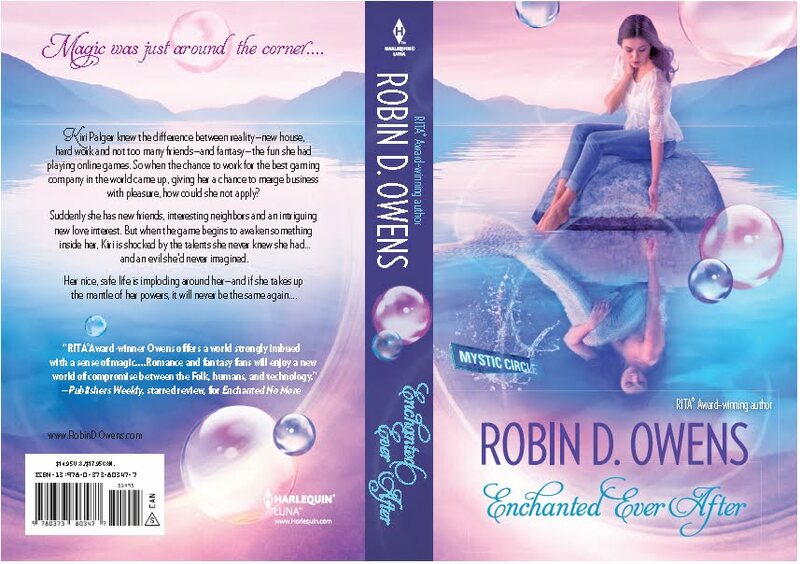 Enchanted Ever After demands a complete read beginning to end (all right, I'm skipping a couple of the first scenes where there were no comments, at this point I can't possibly look at them with anything but weariness and touching them would just lead to a terrible mess. If the copy editor has suggestions, I'll look at them again, otherwise they will just have to stay). 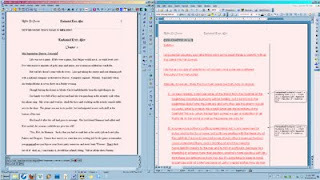 After beta comments, I'm chopping a full scene in chapter 4 and rewriting, including only a few bits from the original. So may you find your own rhythm and be pleased with it this week. I've learned the last couple of days that, no, I do not think well in the heat. It's 6:01 now and I've been up since 4:15 trying to cool down the house...which was 84 on the main level. Yes, I AM drinking a lot of water, and NO, my brain is not working as well as I wanted, and I sure don't have the energy to pull the 10-14 hour days I'm accustomed to when I want to work on revisions/edits. I've been lucky enough to make 2. So, work arounds: I can clear out an area in the half-basement (scary but cool basement). I can clear out an area in the back storage room which has an ancient (but working) air conditioner...of course cats would not be able to come in and out, and since they hardly make a peep, I wouldn't hear them at the door. I can find an inexpensive motel close by and rent for a couple of days. But right now I need to write while I have the brain cells...later. Writers and Critique: I have a critique group and beta readers, and much of the time I take their advice (especially my critique group). But I've been downloading some self-published ebooks -- I'm no stronger against temptation for a free book or a .99 cent book than anyone else -- and some of these books are by acquaintances and friends. And I wonder why they aren't better. Because I know these people, and I know they've been in writing groups for years (not my critique groups, not that I think anyone in my crit group -- ok Cate, but you're new, reads my blog). Some people won't take critique. That's how it is. They WON'T learn. This is not aimed at them because they won't change. And heaven knows, if I was stupid enough to put my first book up on amazon, I'd lose ALL my readers, because I wrote it without critique and it is TERRIBLE. Even the second version, with critique, is BAD. And, I truly get that people believe their first work is good. I did. I still think the story isn't too bad (but probably more fit for a historical rather than a contemporary, and NO I will never put it up unless it's to demonstrate "do not do this"). And I understand that at whatever level, people are writing the best book they can and they believe in that book. After all, I do. I guess it comes down to having people tell you the truth -- as much as it hurts to hear that truth. And the truth is, my friends, that your work you say is contemporary is not, it's dated; or that wo/men never behaved like that, even in romance; or that there's nothing original in your plot and your characters aren't enough to carry me along. MY OPINION. Of course I would never say that to their faces, especially about a work they've already published. And I guess that makes me a hypocrite. Okay, I would say that to them if they asked me. Thankfully, they haven't. You all asked for a bird Fam, here's Zem (name chosen by the winner of Brenda Novak's auction for that). He's the most beautiful hawk in America, and the smallest raptor, an American Kestrel. Race Bayrum, the hero, will be his Fam companion. The roof is done. It looks pretty much the same as the old roof, the color I chose is so close, but, of course, newer. I can sit in my rags (which are looser than my going out clothes, imagine that). No pounding will ensue. I do not need to keep my doors open so they can use inside outlets for their power tools. Whew. Back to work! May you have a cheerful day. I sent in the Wild At Heart E-project to my agent to see what she thinks. The story now stands at 4 chapters and about 10.6K, so I think it will end up being a long novella, again. About 30K-40K, nearly double what agent said would be the minimum. So that's out. I'll go back to writing it when the roofers are done. The ripping and the pounding have been a whole lot more disruptive than I'd anticipated. I will have lunch time today to write, and after they leave this evening (which was after 8pm last night). In any event the proposal is out, which is always a good thing...however, other than those of you who read the first pages, this has not been seen by ANYONE. I, of course, went over it several times, but I have the problem all fantasy writers face (what's in your head didn't make it to the page, which leads to reader confusion). I'll be interested in how this process goes. Thanks for the feedback, and hanging in there with me. I've been thinking lately about the wonderful things about working at home/working for yourself. This morning it was shoes. Where are my trainers? Or, maybe, my red crocs. With socks today. I usually wear shoes and two pairs of socks during the winter because my feet get cold, and I ALWAYS wear rags to work, literally holey stuff with tea "oops." Unless someone is coming. Like the roofers, supposed to be here by now. I have "going out" clothes on today, jeans and my fav t-shirt with Shakespeare with the tatts and brow ring. (I think I posted it here somewhere). So wearing what you like is very cool. So is starting work when you want. I HATED mornings when I had the day job, but now that I'm on my own, mornings are a good writing time. And I started work today at 5:45 a.m. Being around for service people/deliveries also counts as a plus. So I am pleased with myself today (and nervous about roofers, of course). Robin (and, no, even though I didn't want this interrupted, they did not come). Today I'm working on the novella (day messed to hell when parents cancelled a gathering). I liked this website and thought you would, too. I mean, info re: baby panthers. May you enjoy all the critters in your life today. I have a very few book graphics up at my pinterest page for HeartMate, general ideas of the hero/heroine and pics of Zanth. Here's the story: Pretty much the first email I got from my editor after I sold HeartMate was "send photos of cat." So I took a couple. But, you see, my computer couldn't process the pics. It was a dark and stormy night...true, spitting snow/sleet and I had to take the FILM down to a local processors and have them make a disk. Then I emailed the photos, saved them and also sent the disk. Thus Zanth on the original cover. 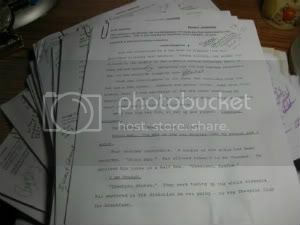 But, as I wrote more, did more research, visualized my stories more, I accumulated more pics/graphics/ideas for each book. So the later books will have more on their particular pinterest board. However, I also copied LOADS of pics from the net and didn't keep track of where I got them, and don't want to upload someone else's may-be-copyrighted pics. Everything up in pinterest is a photo by me or I've tracked the sources down. So that will also limit what I might put up. That's the scoop and now there's someone to keep me company in the word wars room and I'll head in to start the pm session on Wild At Heart (that story I sent an excerpt to earlier). I have art and stuff that I've sent to my editors from my very first book, so let me know what you'd like to see. I suppose I should put up an awards page. I spent HOURS figuring out names for some secondary characters of Heart Fortune, a rival of my hero, Race Bayrum, and his recently ex-lover. Urgh. I wound my way through Culpeper's Color Herbal, Cunningham's Encyclopedia of Magical Herbs, the scientific website I use for naming, and A Druid's Herbal. I had very specific ideas in mind for the names, of course they had to be plant-based, and not too spoilerish (I don't like giving away my villains too often by a nasty name). So falling by the wayside were Hirtel Something, Scratchdaisy (don't you love it?) Calamas Rattan, Calamas Serge (I didn't know about the Walt Whitman poems), Yanth Buckbean, Ari Penstemon, Jope Purpurem, and Stiffleaf (I kid you not, someday I will HAVE to have a Stiffleaf). Anyway, may you be amused rather than frustrated with any snags. Yes, it's here, and yes I am struggling with Day 1. There is significant construction going on next door...but, a rationalization, of course. Anyway for those of you who missed it, here's the link.